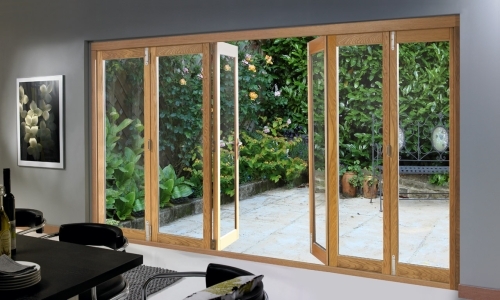 Bring in more natural light & open up your home with a uPVC patio door. Fitting uPVC patio doors to the rear of a family home is a firm favourite in the UK, letting in loads of natural light, making a room feel bigger and giving excellent access to the garden area. 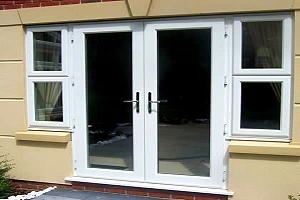 Widely used because they are competitively priced and visually attractive, patio doors made from uPVC also offer a combination of energy saving and security features that make them hard to beat. For those of you who are considering adding uPVC patio doors to your home, it’s going to be worthwhile to spend some time looking at the different types of designs available. 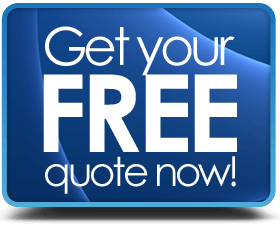 Knowing what the key features or advantages are, and having a better idea of the kind of costs involved in buying new uPVC patio doors, can help you come to a decision about which type of door design is the most suitable one for the job at hand. What is so good about using uPVC as the frame construction material? uPVC is well known as a super material to use in double glazed doors & window manufacture because it lasts a long time and is well priced. Alongside that, uPVC has a number of other qualities that make it a great choice. It doesn’t suffer from excess distortion during prolonged wet or dry weather. Timber versions can be hardwood or engineered wood, both of which have excellent durability and visual appeal, but they can swell when they absorb water, or shrink when they dry out. You don’t need to paint it or stain it – and then re-paint or stain again every couple of years. uPVC patio doors can be different colours and the colour is permanently bonded in order not to fade, crack or peel off. uPVC itself is a good insulating material. So is wood, but timber has other issues. Aluminum frames need to have a special thermal break built into them in order to be insulating. This makes manufacture more complex and that pushes its’ cost up as well. Massive supply chain – so many sources of suppliers & manufacturers means huge choice when it comes to products and prices. “Environmentally friendly” is now a phrase that lot of us have in our vocabulary. Not only can uPVC be recycled, you can actually buy uPVC windows & doors manufactured from recycled material. In effect, you have a well priced, long lasting, visually appealing, strong, secure and environmentally friendly product – so what’s not to like about uPVC patio doors? 1 Popular Patio Door Designs? 3 How much do patio doors cost? 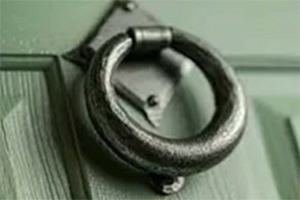 4 Links to other types of doors. What are the most popular uPVC patio door designs? You can separate double glazed uPVC patio doors into three categories based on how they function, and by that we refer to how they open and close. The way the opening function can impact on the suitability is not always that obvious, so understanding the way the doors work beforehand can make sure the patio door that you fit is one that you can comfortably live with for many years. 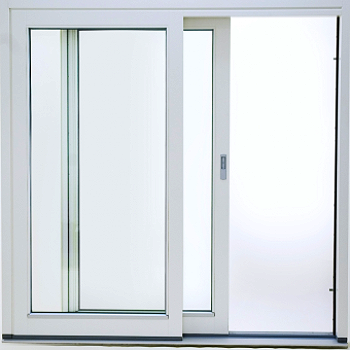 Sometimes referred to as inline sliding or by-pass patio doors, they move side to side within the outer door frame. The doors are fitted to guide tracks above and below which allow the doors to slide past each other when opened. Each Door panel will run in its own track to allow it to by-pass the other door panel(s). Different width openings can be accommodated by the use of additional door panels. If the aperture for the door is excessively high (over 2400 mm or 8 feet) it is possible to add fixed top panels. The smallest installation will obviously consist of 2 door panels and the maximum number of panels that can be used within a particular sized aperture will depend on the individual panel width. For example, a 3-metre-wide aperture could fit 2, 3 or even 4 panels. Sliding patio doors can open to the left or right. With a 4 door set, the 2 outer panels are sometimes fixed into place and the 2 middle doors slide to the sides – this configuration is sometimes referred to as a sliding French Patio door. One disadvantage to note, is that even with the door fully opened the panels remain within the frame and therefore will reduce the actual remaining clear opening entry/exit space. Tilt & Slide patio doors. A variation on this design is the tilt & slide patio door. In normal mode it opens and closes as a regular by-pass version, but due to a clever hinge system you can change the door mode to tilt. The tilt function allows one of the panels to “lean” backwards from the frame creating a considerable amount of ventilation from the ensuing gap. The doors won’t slide whilst tilted, and the degree of tilt has a mechanical limiter which only allows the door panel to lean into the room by a safe amount. Although, technically it is a type of sliding patio door, the Bifold patio door is famous for the way that it opens and closes. When closed it looks the same as a regular sliding installation, but upon opening bifold doors they “stack” rather than slide. When you open them, the doors fold, or concertina, to the side. In this way the panels are neatly tucked away at the sides allowing an uninterrupted entry/exit way. The panels can be stacked to the left or to the right, sitting inside or outside of the door frame, giving extra flexibility. Held into place by roller that run in overhead and underfoot guide tracks, the door panels are surprisingly easy to manoeuvre into position. You can elect for either the top track (top hung) to take the weight of the door or the bottom track (bottom hung). If you choose a top hung installation you need to ensure the overhead track has a very secure fixing into the door lintel above. Bifold patio doors are often fitted with low level or rebated thresholds, this means you don’t have to step over anything to enter or exit and makes the installation take on a kind of “seamless” quality when the doors are open. To make them every-day-use-friendly, where you have 3 or more panels, a traffic door can be fitted. This is one panel that can swing in or out like a regular door, which allows easy exit or entry without having to open all the doors at once. It could also be worth your while, especially if there are children around, to fit bifold doors which have a “finger-safe” option. This is a small rubber gasket at the edges where the doors meet which prevent serious injury if your fingers get trapped between the panels during closing. The most popular design of swing door for a patio is the French patio door design. Again, this is a door style that is instantly recognisable from the way it opens, they swing in or out, but French doors also have signature visual styling. Typically, the doors themselves will consist of a series of small glazed panels in a 2×3 or 3×5 configuration (see image on the right) – although it’s not compulsory to have small panes, you can do without them. 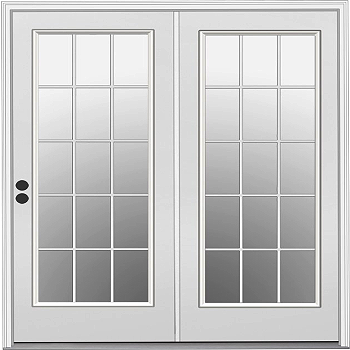 French patio doors consist of a pair of identical doors fitted side-by-side and will always swing open from the centre – either outwards to the exterior, or inward into the room. If you have a small interior or lots of furniture etcetera, it could be a good idea to have them fitted opening outwards. The downside of using French patio doors is that they come in pairs and so there is going to be a practical limit as to how wide each door can be. The narrowest set of French patio doors would be around 900 mm (2×450 doors) and the widest around 1900 mm (2 x 950 doors). Over the practical usable width limit, if you have enough room you, could fit 2 sets into the aperture or use fixed side panels to take up the space. These are also swing doors in the sense that the main door is hinged on the side and opens and closes like a regular door. However, it has an additional function in that the main door can also be tilted inwards. Very similar to the tilt & slide patio door, it has the same ability to create considerable ventilation from the tilted inward door, but instead of being able to slide, the main door only swings in and out like a regular door. Primary features of patio doors. It’s normal for some features of any door or window to come as standard and for some to be classed as optional extra’s – what is shown below is what you could reasonably expect to be included in the prices and what may be attract an additional cost. Modern double glazed uPVC patio doors are designed to be as energy efficient as possible, but they are not as good as a well insulated wall. Maximise their efficiency with Argon gas filled sealed units, solar control and low-emissivity glass. As we have mentioned a few times earlier, the use of double glazing for your patio doors is the very least you should be considering, for energy saving, safety and security reasons. Energy wise, any glazed area in the house is going to allow more heat or cold to transfer than an insulated cavity wall. Bear that in mind if you are taking out a wall to fit a patio door. Paying attention to using as many energy savings features as you can, will really help improve the insulating properties of your patio door. Use gas filled double glazing – Argon gas transfers heat 60% less efficiently than “normal air”. 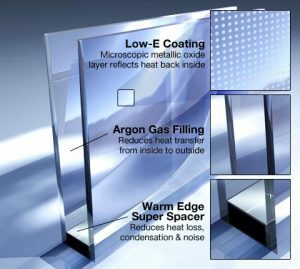 Use low- emissivity glass in the sealed unit – it reflects heat. 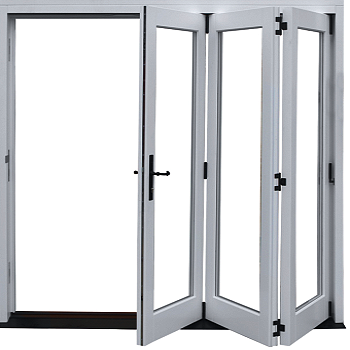 Security & safety wise, full length glazed patio doors will have toughened safety glass, which you could upgrade to laminated versions. Both of these types of glass break in such a way as to prevent the likelihood of serious injury. They are also more difficult to break in the first instance and therefore are good to use for security reasons (there are rules covering glazing for doors here). In terms of appearance, frosted or opaque glass is unlikely to be used in a patio door, but could be nice to use in a side panel. Georgian bar inserts are often used within the double glazed units to give the effect of the door being made from small panes of glass. uPVC patio door colour options. Whilst white still remains a very popular choice in terms of colour, you have a wide choice when it comes to how you want your installation to look. All three types above offer a good range of colour options in both plain or timber-grain finishes. How much do double glazed uPVC patio doors cost? What are the average prices in the current market? Many uPVC patio door prices will fluctuate dependent on both the design you choose and the persons or company that installs them. 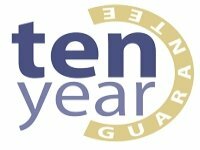 We recommend that you use a FENSA or CERTASS registered professional to fit your patio doors for 2 reasons: 1) they have the right experience 2) they can certify the doors as compliant with UK building regulations. Why not check out some other styles of doors for your home? Whether you use them as a set of patio doors or as an upper floor window opening, French doors are classy and have all the latest features. 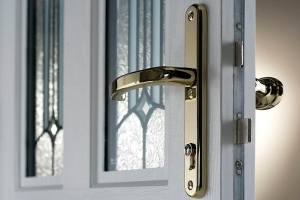 Great looking, strong, secure & long lasting front doors impact upon visitors & makes your home more desirable. Spectacularly wide opening and super easy to use, Bifold doors are fast becoming “the must have” type of patio door design to fit in any home. Back doors are just as important as front doors, bringing security, energy saving and good looks to your home.